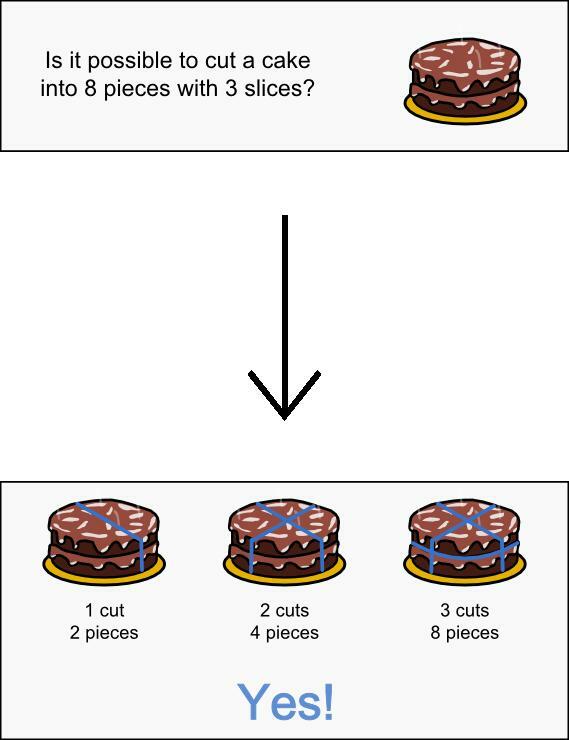 Can you cut a cake in 8 pieces with just three slices? The following multiplication problem uses each number 0-9 only once. What are the missing numbers for *? What is the difference between half a dozen dozen and six dozen dozen? (It’s not nothing). The following equation is wrong: 101 – 102 = 1. Move one numeral to make it correct. Two girls wish to cross a river. The only way to get to the other side is by boat, but that boat can only take one girl at a time. The boat cannot return on its own, there are no ropes or similar tricks, yet both girls manage to cross using the boat. How? It just might be that my English isn’t very well, but I fail to see why (b) is a puzzle at all. Isn’t “half a dozen dozen” just 12*12/2=72, and “six dozen dozen” just 6*12*12=864, and so the difference is 792? Am I missing something here? Why would we need a hint that “It’s not nothing”? How could they be equal? There may be other solutions, this was the first I found and I was brute forcing a bit by hand so I stopped. It’s more of an English puzzle than a math puzzle. Native English speakers who have the phrase “half a dozen” hard wired in their mind to mean “six” usually have trouble parsing the difference in the two values with a casual reading. (d) first one girl takes the boat across the river, and comes back. Then the second girl gets in the boat, crosses the river, and comes back. doesn’t say they both have to end up on the other side of the river at the same time! D) One girl is on one side, the other on the other. One crosses, then the other. above, but I did come up with the following..
‘line segment’, but it was all I came up with. 101 – 10 = 21.